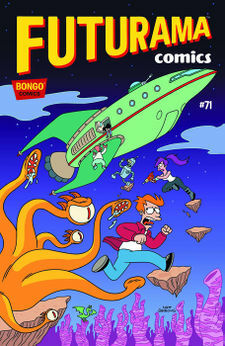 Characters on the cover: the Planet Express ship, Zoidberg, Amy, Bender, Fry, and Leela. "Pizza Wars" is the seventy-first comic issue, released 28 May, 2014 in the US. A tale that brings Fry back to basics as a pizza delivery guy. In this case, however, the Planet Express crew is making a special delivery from a planet that oozes sauce to a Brooklyn pizzeria. But hold on to your cannoli, the mob wants a piece of the action and (BADA-BING! ), the Planet Express crew discovers there's a little special ingredient in their shipment that they never expected! Sofia Marinara: Hello again, Fry. Have you missed me? Fry: I miss you like Canadians miss living in igloos. Bender: Ha! That's what you get for trying to eat the inside of a spaceship! Tony Marinara Jr.: Would you watch the hair? I work on it a long time, and you hit it. He hits my hair. Hermes: It's true! Our help will only get them in more trouble. My goodness, Professor! A moment of clarity in the usual sea of lunacy! Farnsworth: Thank you...Now if we can find my tennis shoes, I should be able to catch the 8:15 bus to a bowl of hockey pucks and see my grandmother's shag rug. Hermes: ...And we're back! I'll call Hyper-Chicken and see what he can do. Bender: Hey! Giadabot is sending me a message using an ancient form of communication known as morse code. She says she loves me and needs my help! Fry: I'm pretty sure Sofia is sending me a message, too...with her cleavage. A Judge bot resembling Judge 723 and Judge 724 is seen. However, he is golden and the number is not drawn on the page. Fry and Leela are apparently not a couple at this point in time. The story for this issue was written by Jimmy Palmiotti, a well-known comic book writer and inker. Alec says to Leela "Strolghino insalata caprese bruschetta fagioli. ", which roughly translates to "Strolghino bean bruschetta caprese salad." The issue's title may be a reference to Star Wars. Posters of the logos for The Who and The Rolling Stones can be seen in the room Fry and Bender get ready in at the start of the issue.